Soundisciples were Bristol’s WHORES OF BABYLON then became Soundisciples in 1998 when the direction of the music changed and a new record deal was secured with Peaceville/Music for Nations. 2 albums have been released so far : `Undefined` ( 1999 Peaceville/music for nations ) and `Audio Manifesto`( 2002 Snapper/Peaceville ). 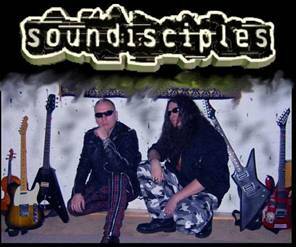 Soundisciples have toured with various known artists including Janus Stark, Pitchshifter, Mortiis, Anathema, Opeth & Paradise Lost. A few years ago there was also a Channel 4 documentary about the band and their tour manager as part of a series called `Tour of Duty` which was about specific bands and their Roadies/tour managers. Gobz also co-own State of Art ( SOA ) Studios in Bristol along with Geoff Barrow ( Portishead ) and is related to current Sisters of Mercy guitarist Ben Christo. A few years ago Whores of Babylon ( www.myspace.com/whoresofbabylon ) was resurrected as a band in it`s own right and now Soundisciples and Whores of Babylon co-exist together with core member links between the two bands. 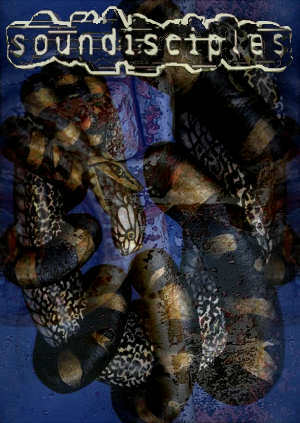 Both bands music can be loosely fitted into the category of Gothic Metal even though they don`t sound quiet the same as Whores of Babylon are a darker and more Classically bombastic beast where as Soundisciples are a more experimental fusion metal band. There is a third offshoot from these two bands that is called `W.O.B – The Noiselab Project` ( www.myspace.com/noiselabproject ), this loosely fits into the Goth Genre although the styles played with here are more along the lines of Industrial, drum and bass & Cyber-gothic , not too dissimilar to the first Soundisciples album `Undefined`. How will this work? well part of the set will be performed as Soundisciples and then with some minor personnel changes, the other part as Whores of Babylon. Although probably at some point both bands will split up into two full gigging machines of their own. There is even a fourth offshoot band that features at the moment just the 2 core members from the Whores & Soundisciples. It is called `The Drunken Pirates` ( www.myspace.com/drunkenpiratesmusic ) . The music is punk with a pirate theme and can only be described as `a bit mental !`, but that’s another story. Soundisciples went through some member changes in 2005 and saw the return of a previous Soundisciples founder & Whores of Babylon head honcho Gobz to the band. Joe, the Soundisciples head honcho also rejoined Whores of Babylon in 2006. A third album `Killbox`is currently being written, developed & recorded and will be released on Gobz LoveGun record label during 2008.